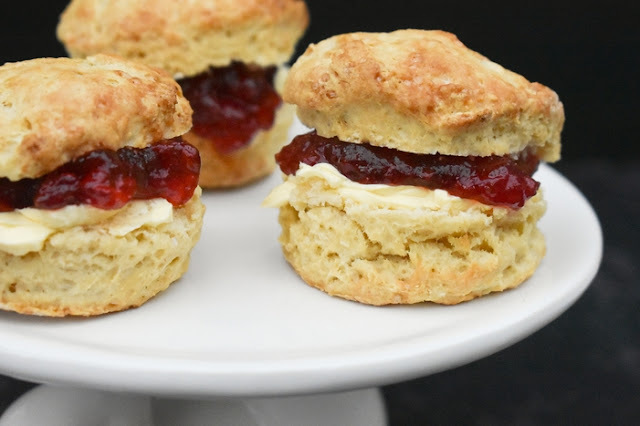 Classic Scones - Hello everybody, welcome back with ZetiraKitchen! Today I will share about How to Make Classic Scones. Scones, cakes from Scotland are English people making this cake as a friend to enjoy tea. the taste is not too sweet or savory, usually served with jam or cream. Scones are generally made from wheat, barley, and oatmeal with baking powder as the developer ingredient, but now i wanna make with flour all-purpose. The dough is formed into circles and divided into 4 or 6 parts and cooked by baking. the texture is soft and crisp. Put a large bowl then pour the flour, sugar, baking powder, and salt. Add sliced butter. In small bowl mix the egg and milk and pour into flour mixture. Sprinkle the large table with flour. Turn dough out onto a lightly floured surface, and knead briefly. Roll dough out into a 1/2 inch thick round. Cut into 8 wedges, and place on the baking sheets that already bast with butter. Bake in 15 minutes in the preheated oven, or until golden brown. Fill with cream or jam in the middle of cake.